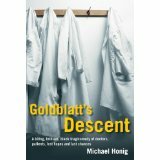 It’s rare to come across a comic novel that is both funny and serious but Michael Honig’s first novel, Goldblatt’s Descent, hits the mark with a satisfying thunk. When we first meet Dr Malcolm Goldblatt he has already descended quite a long way. In fact he knows that his current locum job represents not only the Last Chance Saloon, but a last chance saloon where the drinks are very hard to come by. He is puzzled as to why this should be, since he has an appropriate and comparatively unusual balance between his medical skills and empathy for his patients. The reader, however, is soon made aware that outside of a clinical setting he has the emotional IQ of an amoeba. He simply assumes that the other doctors on the team are all like him, and has no insight into their inadequacies, needs and above all their terror. We of course see all their difficulties, and very funny they are too, and even funnier is the team’s failure to understand Malcolm Goldblatt, who they all find threatening in one way or another. The most terrified and inadequate doctor of all is Professor Andrea Small, the head of Malcolm’s unit and leading specialist in Fuertler’s Syndrome, a rare and virtually untreatable disease that almost never kills anyone. Honig exactly captures the disconnect between her external behaviours and her internal logic. To her, ricocheting from moment to panic-stricken moment, her actions make sense, whereas anyone observing her would diagnose insanity. She is a great comedy character. All of the doctors suffer from this disconnect to a greater or lesser extent and most of the comedy comes from Honig’s crisp dissection of each one in ways that are reminiscent of Kingsley Amis at his best. However he also understand the basics of comedy, and knows how to make a simple joke work on the page, and also knows exactly how many simple jokes are enough (answer: not many). His prose also captures something of the flavour of Catch 22, which entirely suits the mad logic of the NHS, and Goldblatt’s take on it. The least mad doctor, Dr Morris, is both the most competent and the least funny, but his important function is to show Goldblatt one possible future. He can stop fighting the system, learn to keep his mouth shut and get on with doctoring, or – and that’s his problem. Or what? Unlike Yossarian in Catch 22, forced to fight in a war that means nothing to him, Goldblatt does have choices. It’s just that none of them are palatable to him. The cover blurb tells us that Honig trained as a doctor, and he sprinkles enough medical jargon through the book to make the background convincing. The patients occasionally have a genuine medical problem, and real procedures are carried out. Some die, but mostly they disappear, discharged or transferred, so that medical staff find themselves in a narrative to which they rarely hear the ending. This is true of the nurses as much as the doctors, but the nurses don’t feature in this book. With his student nurse-shagging days behind him Goldblatt has become like all the other doctors, completely unable to comprehend what happens on Planet Nurse. Woven into the dominant medical/NHS themes of the book there is a secondary theme of Central European Jewishness. It adds to the book’s texture but seems to have little relevance. Although Malcolm Goldblatt appears at the start to have reached rock bottom, so that the only way is up, he inevitably discovers that the Last Chance Saloon has a cellar, and still murkier places beneath that. In the course of the book we learn if he is able to find his way back towards the light but one thing is clear, we are going to hear more of Dr Goldblatt. I only hope that wherever he ends up Professor Andrea Small is right there with him.